By assigning Education Perfect content as a task, you can view in-depth reporting, ensure your students are staying on-task in class and make it quick and easy for everyone to work on the right activity, whenever they want and wherever they are. How do I make a copy of an existing task? Click on Tasks & Homework from your Control Panel. Click the + Assign Task button. 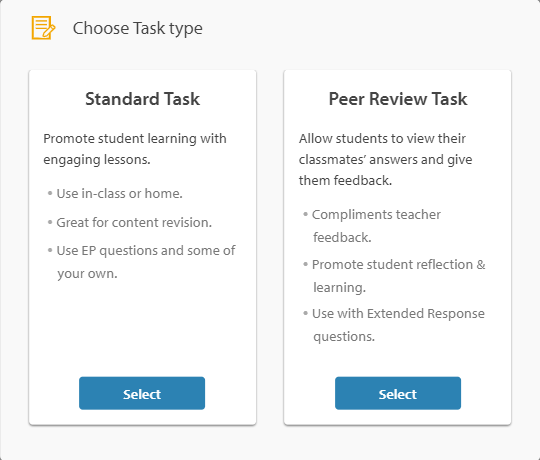 Choose between a Standard Task or a Peer Review Task. Peer Review begins after students have finished working on a task. It lets students see how their classmates approached questions, and gives them the chance to give and receive constructive feedback on those questions. Click Who? then select the class you are assigning the task to. Once you've selected a class, optionally click Assign to specific students to select individual students in your class to assign the homework task to. This allows for differentiation in the classroom, as you can set students material of varying difficulty based on their skill levels. If your chosen class isn't visible, try using the Search Classes search bar or toggle between My Classes and All Classes. The All Classes option will display all the classes we have registered at your school, as opposed to just the classes you're listed as teaching. Clicking on the What? section will automatically open the Content Picker for you to choose the material in. Clicking on the folders visible here will display their contents on the right. Once you have chosen the appropriate material, click on Add lesson/list and then the Confirm Selection button in the bottom right. If you close the Content Picker, click Open Content Picker to continue selecting content or make changes. If you are assigning a vocabulary list as a task, the option to select which learning modes you want your students to complete will be available. Each mode progresses independently from the others, which in turn means that students can earn stars from each one individually. 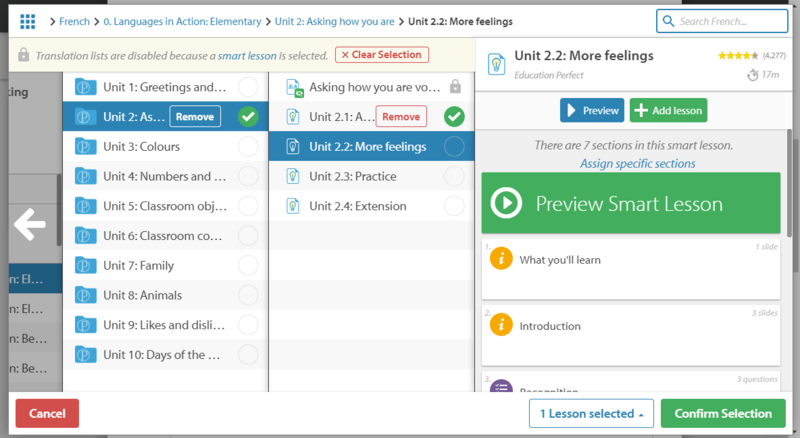 You can assign just a subset of the sections in a Smart Lesson by clicking Assign specific sections and unticking any sections you don't want. This can be useful to remove content you aren't ready to cover with your students yet, or to reduce the amount of time required to complete a task. Tasks default to the title of the selected list, or their module if multiple lists are selected. 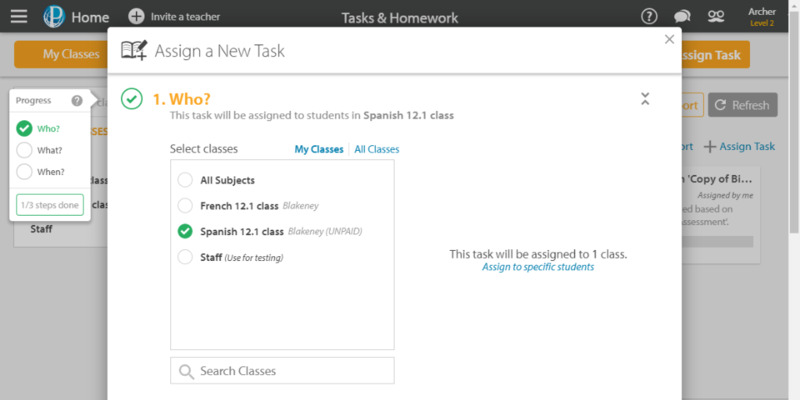 You can edit the task name and add a description of the homework you are setting. Click When? and choose the start and end dates for the task. Selecting Allow late submission for the following week will let students continue to work on the task up to 7 days after the due date. All work done after the due date will appear as a late submission in reports. You will automatically get a live feed displaying students' progress through the task, including notifications when they complete sections of a Smart Lesson, an entire list, or a translation direction. You can choose to enable focus-tracking to be notified when they are not focused on the task in class by clicking Live Feed and ticking Notify me when students go off task. For more information, see How do I know students are focusing on their work in class? Dash is a fun revision activity that is accessible through most Smart Lessons. You can find a full guide on how to best use Dash here. 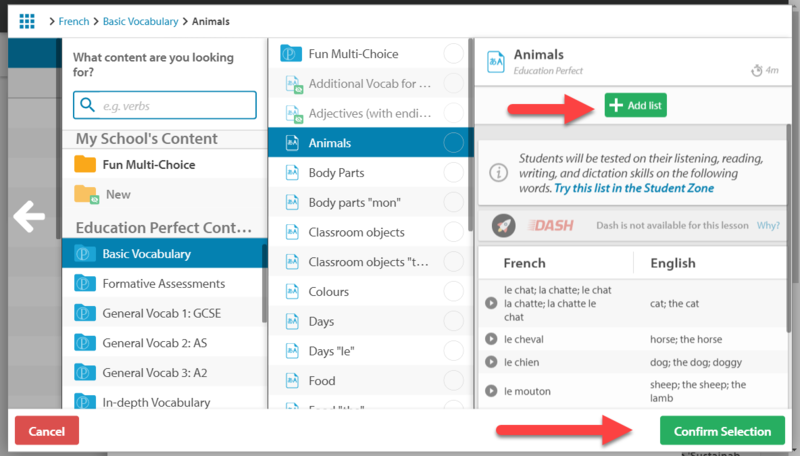 When you are assigning a vocabulary list, you'll be able to set how many times the students are required to work through the assigned content in the Completion Options section. Choosing Once requires the student to get each question right once, or to earn one star. Twice requires students to revise all content 24 hours after the first time or to earn two stars. Three times requires the student to further revise the material a week after the second time, earning three stars. This option is not applicable if you are setting a Smart Lesson. When selecting a non-default completion option, make sure your due date allows enough time for the students to finish the task. When assigning a vocabulary list, you will also have the option to Include students' previous progress which allows the students' previous completion of the material to be included, or Require students to earn a specific number of points to require students to earn a set number of points instead of fully completing the assigned content. This can be used when you are setting a large amount of content in the task and don't require full completion. These options are not available if you are setting a Smart Lesson. Tick Include all students' attempts after... to allow the students who have worked on the task after a date you choose to only complete the unfinished portion of the lesson. This ensures that if the student has worked on the assigned content recently in their own time, they will not be required to complete it again. Tick Email me a completion summary report to receive a detailed report on how your students performed in the task, their overall completion and where the class excelled or struggled on the assigned material. This will be sent when the due date passes; you will receive another email when the task's late submission period closes (if applicable). Selecting Email my students about this task will send the students an email notification letting them know they have new homework. This is sent as soon as the task begins and the students will be able to click on a link within the email to go straight to the task. If you turn this on, you will be able to select Email my students' parents about this task which will send a similar notification to their parents if we have their email address on record. Selecting Send me a report about which students have been emailed will let you know if we've had difficulty sending the notification out to any of the students in your class. Tick Disable question timers to remove the countdown timer from the questions. This is useful for younger students and students who need extra time to complete activities. Even if you don't disable timers for the whole task, individual students can disable timers in their account. Tick Disable Cheers while doing this task to prevent cheers students are sent from displaying while working on the task. This helps prevent disruptions if you are working on the task in class. Once you're finished, select Assign Task. For full details on how to create a copy of an existing task, check out our guide. If you are selected Peer Review, you will then be prompted to choose which questions to enable Peer Review on. 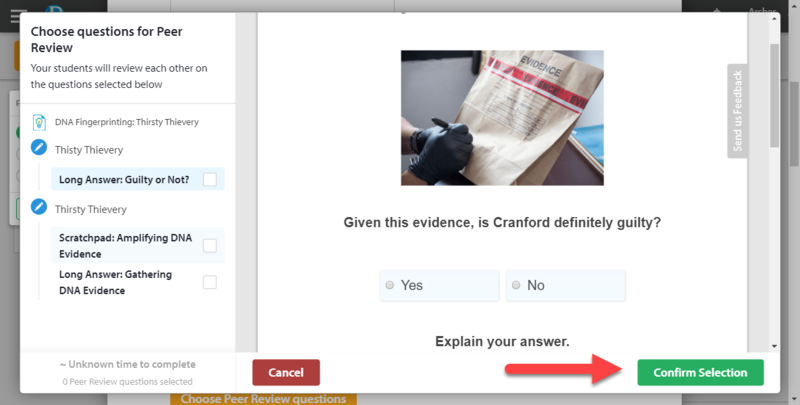 You can select this questions by clicking on Choose Peer Review questions. You will then be able to tick the questions you would like to enable Peer Review. Please note that only Extended Response questions can be selected for Peer Review. Automatically marked questions will not be available. For full details on the options you have when assigning peer review work, check out our guide.